ICONA POP performs free concert at the 5 Towers Stage at Universal CityWalk. 5 Towers at Universal CityWalk is quickly becoming the place to be for the world's top musical acts to perform when in Los Angeles. With top named acts such as Cee Lo Green, John Legend, Justin Beiber, Carly Rae Jepson and Ludacris (to name a few) gracing the stage, international hit-makers Icona Pop was the latest big name artist to play at one of the largest free venues in the country. 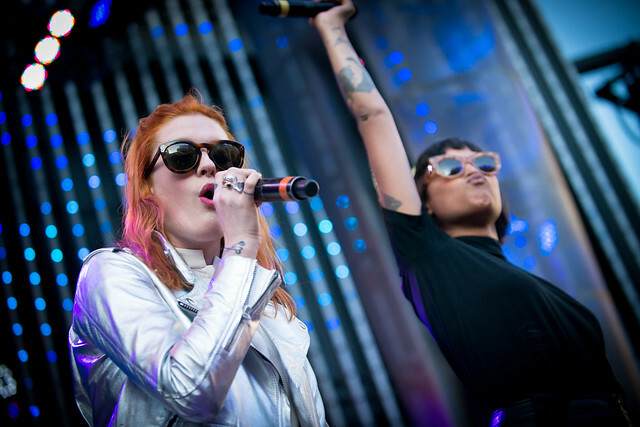 Icona Pop took a break from Miley Cyrus' Bangerz Tour to perform at CityWalk. In town supporting Miley Cyrus on her Bangerz Tour, Icona Pop took time out of their busy schedule on Feb. 21st to perform two of their hit songs during an early free show at Universal CityWalk. The duo, consisting of Aino Jawo and Caroline Hjelt took the stage and sang an acoustic version of their recent single "Just Another Night" before exploding into their hit song "I Love It." Icono Pop are currently on tour with Miley Cyrus through April then in May, they head out on Katy Perry's European Tour.